The above picture shows a cast of the best complete example out of the four projectile points found on the Domebo mammoth kill site. 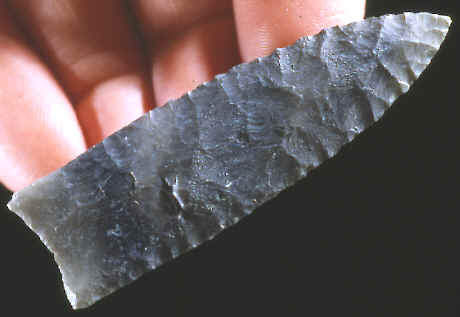 This unbroken fluted point was found during the excavation of the site in Caddo County, Oklahoma. It was found near a pair of articulated mammoth vertebrae and was apparently used to kill the animal. It measures 2 11/16 inches (6.8 cm) long. 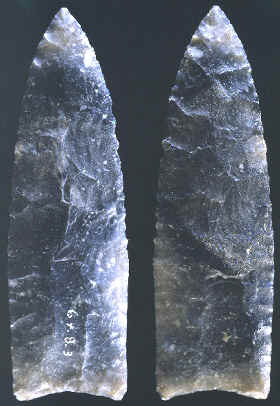 This picture shows both sides of the original Clovis point that was found during the excavation of the Domebo mammoth kill site. The Domebo site is a mammoth kill site located in a deep arroyo-like branch of Tonkawa creek, called "Domebo Branch", about three miles east of Stecher, Oklahoma in Caddo County. The site was discovered by Mr. J.E. Patterson when he found portions of a mammoth skull, tusk and vertebrae exposed in the bank of this spring fed creek. The site was first reported to Adrien D. Anderson of the Museum of the Great Plains in December of 1961. The excavation team was composed of archaeologists, biologists and geologists who worked out of the museum of the Great Plains in Lawton, Oklahoma (Leonhardy 1966:16,18). 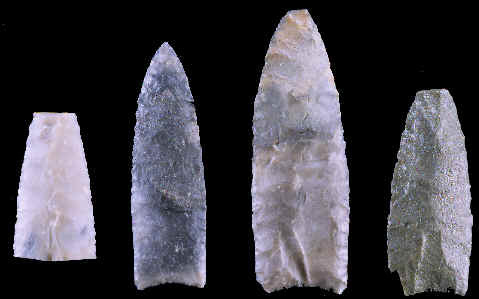 This picture shows all four of the projectile points that were found during the excavation of the Domebo mammoth kill site. The mid-section on the left was found during the initial reconnaissance of the site and initiated the immediate excavation project. It was found in the bank near two exposed vertebrae. Excavation revealed one disarticulated mammoth skeleton. Although no cut marks were found on any of the bones, placement of several of the bones suggested butchering of the animal had occurred. (Leonhardy & Anderson 1966:16). Also found were two complete fluted points, one mid-section of another projectile point and three flakes. These artifacts were made from an extremely fine chert similar to that found in the Edwards Limestone Formation of central Texas (Leonhardy 1966:16,18).